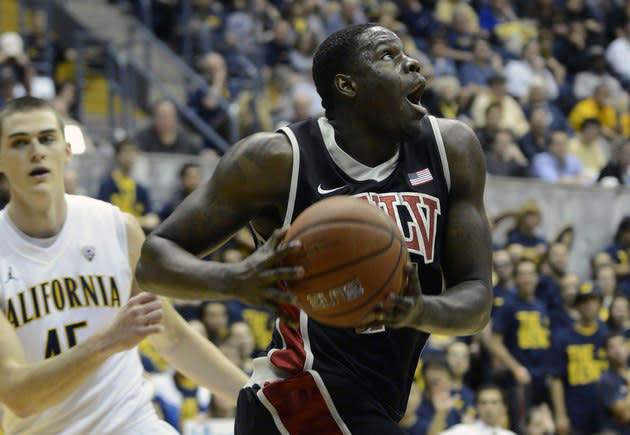 If Anthony Bennett goes on to win national freshman of the year honors and muscles his way into the overall player of the year race, the UNLV freshman's performance against Cal on Sunday may be remembered as his launching point. Bennett had scored in double figures and made an impact on the glass in all seven of the Rebels' previous games, but the 6-foot-8 forward saved his best for a one-point UNLV victory on a national stage. He scored 25 points on 9 of 17 shooting, grabbed 13 rebounds and played solid interior defense, establishing himself as a potential future first-round draft pick next June. "We know Anthony's going to have a long career at the next level," Dave Rice told the Las Vegas Review-Journal Sunday night. "We're just happy he's here with us as long as he's here." What's particularly impressive about Bennett is he pairs light feet and soft touch with a powerful frame. He showcased that repeatedly down the stretch against Cal, following a soaring baseline jam with a smooth 12-footer from the opposite side of the floor. With Mike Moser sidelined for a minimum of a few weeks with a dislocated right elbow and Khem Birch likely needing some time to integrate himself into the frontcourt rotation, UNLV needs Bennett to continue to play at a high level. He has averaged 19.5 points per game so far this season, most among freshmen nationally.